We had a very successful Celebration of Youth at Esher High School last Saturday, although there was a great deal of traffic chaos in the surrounding area that afternoon causing many of us, including me to be late in setting up, and some guests struggled to arrive on time. Nevertheless, the performances by young people were of the highest quality that I have yet seen, and there are pictures of the acts on our Twitter page. I would have to single out a rap duo from the Amber Foundation who composed and sang their own rap; a singer aged 14 from Windle Valley Youth Project who had an amazing voice for someone so young, an electric guitarist also from WVTP, the very young but great band called Sweet Revenge and finally the Phoenix dance group. It was a great reminder of the achievements and artistry of so many young people. On Monday evening, I went to Raven Housing Trust’s own celebration of the achievements of the young people that they’ve encouraged to take responsibility for the estates where they live. The event was held at the (rather too large) Harlequin Theatre, Redhill, but I was impressed by Raven Chief Executive’s talk. Whereas Surrey Youth Consortium have won 27/31 youth centre contracts, Raven have won the remaining 4 in the Redhill area, and I could see why. I have helped RAISE Chief Executive conduct interviews for new staff, and have offered to someone who I am sure will be outstandingly good, and also another candidate who though not appointed may be going down the self-employment path as someone with 10 years training in fund raising and related matters. Great potential for the voluntary youth sector..I will be getting in touch with him again. I spent an afternoon at Horsham as a speaker /facilitator with my colleagues in West Sussex Council for Voluntary Youth Services. Interestingly West Sussex CC are using a commissioning process to invite the voluntary sector to state what they can offer against their own “Service delivery Framework” (needs analysis) and will then in pursuit of localism give grants to reliable partners to deliver that locally. My colleagues in WSCVYS are being paid by WSCC to facilitate this discussion. West Sussex CC have a highly differentiated approach – meeting local needs locally. 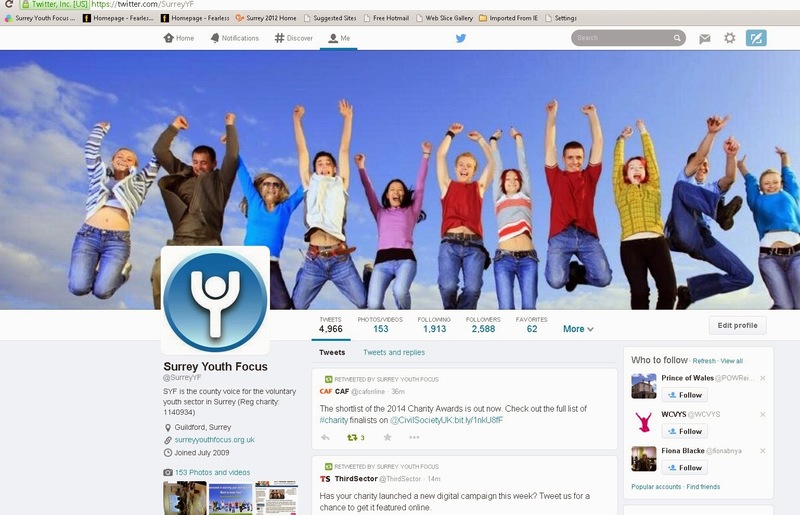 Meanwhile back in Surrey the Surrey Youth Consortium are signing off today on the contracts they won some weeks ago, but which have since been subject to lengthy post- award discussions. Interesting to compare/ contrast approaches. I think I will be getting some follow up consultancy work in the Sussex area about consortia and mergers. However, my high spot this week was in London on Wednesday afternoon at a Business in the Community (BitC) launch of the United Futures project. This links big corporates – the lead speaker was the CEO of O2 (Telefonica) – to voluntary sector youth organisations, through UK Youth, and National Children’s Bureau with backing also from NCVYS. I was invited because of our “4x4 Project”, and after meeting a few weeks ago in Guildford with BitC’s national director of the programme. I have lots of follow up contacts to make. A good week… just don’t mention petrol to me….soon be Easter break though. Well an intensely busy week - I am off shortly to the Surrey Sports Conference which is again at Kempton Park , and organized by Active Surrey for the Surrey Sports Partnership. The TV rugby and tennis presenter John Inverdale is chairing it, so I’m looking forward to it today. Last night was the annual High Sheriff’s Youth Awards presentations to seven organisations, most of whom are members of ours. It was hosted by Exxon Mobil at Leatherhead and was a useful networking opportunity. Earlier on Thursday I had attended my first Surrey Child and Adolescent Mental Health Services (CAMHS) Board at which it was disclosed that there are some 8 different providers and pathways in the medical world alone for young people with ADHD; this was somewhat ironic as I had been with Nancy Williams at The Studio (ADHD Centre) the day before discussing business plan options, and regretting the complexity of the system. I also had a good meeting with Business in the Community on Thursday (busy day) building links and actions between us. Earlier in the week was more about internal mechanics – a team meeting to discuss our draft business plan for 2012/13, and my Chairman and Vice-Chairman conducting my appraisal; it does make a huge difference to feel supported as a CEO. On the national scene, I have only just come across the important "Outcomes Framework for Young people’s Services" published by NCVYS/NYA/Young Foundation, which is now up on our website, and am watching developments about the Youth Contract which is one of a series of initiatives aimed at providing opportunities to young people- like the Work Programme, Apprenticeship Scheme, and, in a different way the National Citizenship Scheme , which is being extended into Surrey this Summer. Tomorrow, Saturday is our big performance event – The Celebration of Youth – at Esher High School with an exhibition at 3.00pm and the performance at 4.00pm until 6.00pm – it’s free and all are welcome! On Monday we embarked on a process of reviewing and updating our website, recognizing that it is our “shop window” and needs constant improvement. That evening I went to Banstead Youth Centre to meet my co-presenter at the Celebration of Youth. She is a youth leader at the centre, and has given endless hours of volunteering, and is keen to study film at university. Come and see us in action on Sat 24 March at 4.00pm at the Celebration of Youth at Esher High School ! I have been drafting our Business Plan for next year to go to Trustees on 24 April, and prior to that for discussion with the team on Monday. It will then form the basis for discussion at my own annual appraisal by my Chairman and Vice–Chairman next week. The key theme I am suggesting is one of “Keep Going!”. There are of course lots of pitfalls, but we have to move forward and focus on what we can control, and not on what might happen. I had a really exciting discussion with a colleague from Oxfordshire Council for Voluntary Youth Services, who is doing brilliant things on a nominal 3 days a week of time, including having great success in recruiting able (graduate level) volunteers into working at OCVYS, and brilliant work with social enterprises. Very impressive. I do think that time spent in finding out other people’s good ideas (“networking”) is time well spent if at least one good idea comes across. The National Citizenship Scheme is coming into Surrey this summer, piloted by the Government funded organisation called “The Challenge” who have been in touch this week. It will be interesting to see if this has an impact on DoE numbers. I am looking forward to a late afternoon discussion today about a social finance project which I hope can be moved forward now. Enjoy the last rugby match of the Six Nations (5.00pm Saturday), and of course Mothering Sunday! Well it’s been a slightly nuts and bolts week by my standards, with no particularly discernible theme. I have now met up with the new interim CEO of Surrey Community Action who are engaged in the difficult process of reshaping themselves. One of SCA’s successes is the Surrey Minority Ethnic Forum (meeting on Tuesday) which has accelerated its progress of helping BME groups to a point where there is now a sufficient number of viable organisations representing minority groups for SMEF to be re-constituted, and people like me to drop out. I had a Surrey Sports Partnership Board meeting in mid-week and its focus was also on re-constituting as a company limited by guarantee, as a step towards becoming independent of Surrey CC. We talked about Surrey’s preparation for the London 2012 Games and its legacy , including a new initiative called Community Games, and Sports-makers, the latter being volunteers who undergo a short 2 hour training course and undertake to get other people involved in sporting activity – mates playing football in the park, cycling group and so on. Active Surrey are the experts. I attended Surrey Chambers open evening at the impressive GLive in Guildford (reminded me that my first visit to the former Civic Hall was to see the Pentangle..anyone remember them - folk group?). I made 3 useful contacts which I have followed up – the power of networking, but regretted having given up alcohol for Lent… Finally today I’ve had an invaluable mentoring session that arose from our first “4x4 “ session - many thanks to PKF, Guildford ! And finally..of course a rugby week-end … England could win on Sunday against France , but I fear the French will be too powerful and experienced. Is Lionel Messi the greatest footballer ever? First person ever to score 5 goals in the European Cup - only 24 and I think 5’ 8 tall – technique and skill over size and physicality…just like the voluntary sector!! Another really enjoyable week, and 1 March means that in the gardening calendar Spring is here, which is great. Slightly more seriously, I gave a presentation to a Children England SE Families Network about social finance, pointing out that historically social philanthropy pre-dated the welfare state and was not new, and then one of the participants sent me the Prime Minister’s recent speech to Business in the Community (which I had NOT seen) which had an identical theme and the same examples. I have since been accused of being Dave’s speech writer!! Both my powerpoint and the PM’s speech are on our website. I met last week with great people from BitC and in consequence this week we already being offered links to major companies looking for volunteering projects. I met with colleagues from West Sussex Council for Voluntary Youth Services and East Sussex CVYS in a network session facilitated by our national umbrella body (NCVYS). The sharing of practice, funding levels, challenges /opportunities is invaluable. My big theme this week, and I think a continuing concern, is about the implications of commissioning/contracting for the voluntary sector. The issue turns on whether you think best value is achieved by competition in the market place with a mix of suppliers (and consequent barriers to sharing data/practice/IPR) or to a more partnership/collaborative approach…..grant giving approach. This is I fear inevitably highly political, and we see the issue being played out now in the current NHS Health Bill. My own approach is to hedge my bets….assume that Commissioning is here for good….but to challenge the (unproductive) cost of the commissioning/ procurement / outcomes / performance management process (“you don’t fatten the pig by weighing it”), to point out the impossibility of measuring outcomes in the complex world of social policy…where I would argue there is no straight line between Action A and Consequence B….and the loss of collaboration that will ensue as contractors compete to hold on to what they have won. I know it’s heresy, but I still think there’s scope for collaboration/partnership…and grants (in a rigorous way). It is a CRUCIAL issue, for the commissioning/contracting model will transform and marketise a great chunk of the sector, and, importantly, I don’t see how the economies of scale/ reduced transaction costs of large scale commissioning are reconciled with The Big Society, Volunteering, and Localism…that apart I don’t have much to say! Regular readers will (not) be absolutely fascinated to know that I had a good session with my MA Theology tutor this week, and my dissertation is progressing - 20,000 words by end May – done half so far. No rugby this week-end, but my church is entertaining the outgoing Bishop of Chichester at Evensong on Saturday. Well… it takes all sorts.